Gainsborough holds the distinction of being the only major 18th-century artist to paint landscapes and portraits to equal extent, although all his life he regarded landscape as his true calling. From a young age the precocious boy showed a natural gift for drawing, often playing truant from school in order to go out sketching in the woods and fields of Sudbury in Suffolk, where he was born. Gainsborough’s artistic beginnings were as much concerned with drawing as painting, and his compulsion to draw for its own sake was the mainstay of his whole career. Gainsborough was not only an obsessive draughtsman but a deft and evocative one too: with about 1000 extant drawings he stands alongside his prolific contemporary George Romney in terms of productiveness. His beloved ‘landskips’, with their sensitivity to texture and light, form the bulk of this output. While he certainly sketched directly from nature in the formative years of the 1740s and 1750s, he also invented compositions that might serve as ideas for fully-fledged pictures, although he rarely elaborated drawings for a particular canvas. 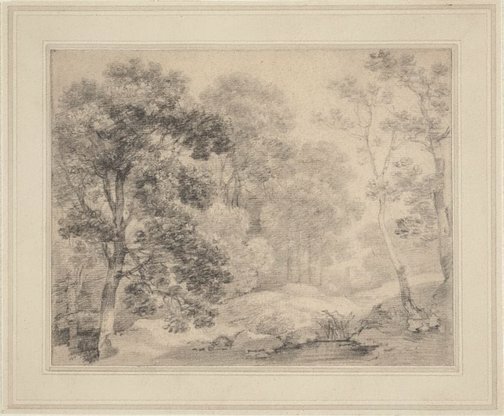 Gainsborough’s attraction to the peaceful and unassuming corners of the English countryside, which he imbued with a poetic sensibility, is illustrated by the silvery graphite sketch shown here. It looks entirely natural, but the composition is highly ordered, with a foreground pool flanked by mossy banks and trees, funnelling the eye through the winding clearing to the church tower beyond. The feeling of hazy distance is created by the softest gradations of tone and the subtle dappling of light and shade across the landscape. In his mature drawings Gainsborough abandoned graphite for media he could manipulate more easily, such as chalk, ink and watercolour. His effects also became more sketchy, more generalised, and often more majestic as seen in A wooded landscape with a figure seated by a pool (opposite, below). This drawing is executed in a broad, loose, painterly style, with blue paper providing the middle tone modulated by black chalk and white chalk. Later in life, Gainsborough drew indoors in the evenings, reputedly with the aid of small models he assembled with pieces of cork and broccoli. Working by candlelight produced the evocative chiaroscuro and scattered, flickering highlights that give such works their undefined, almost vaporous quality. Indistinctness is part of the aesthetic; presumably the smudgy shape in the foreground represents a cow stopping to drink at a still watercourse while a herdsman takes a pause on the bank. Along with another chalk drawing in the Gallery’s collection, titled A wooded landscape with a horse c1786, this sheet is one of a number on blue paper (most probably from a dismantled sketchbook) in which the artist explored unending compositional variations, arranging and rearranging basic landscape elements in search of an imagined ideal. Prints & drawings Europe 1500-1900 , Sydney, 2014, col illus p 8, p 82, col illus p 83.